I love turtles. Not the chocolate kind or the teenage-mutant characters made famous in the 1980s but the hard-shelled ballerinas of the ocean. I almost swallowed my snorkel the first time I saw a wild sea turtle. Watching colorful angelfish in Maui several years ago, a turtle larger than my suitcase floated into view. It gracefully maneuvered around snorkelers in its pursuit of seaweed, chunks of vegetation disappearing down its throat as excess water squirted out its nose. Since that encounter I look for turtles whenever I’m at a coastal destination, even one more often associated with longhorns and oil barons. Everything is bigger in Texas, including the number of turtles found here. There are only seven species of sea turtles in the world and five can be seen in Texas – the green, loggerhead, Kemp’s ridley, leatherback and hawksbill. In keeping with the Lone Star state’s entrepreneurial spirit some turtles even hold jobs! A few lucky tourists visit them each week at the National Oceanic and Atmospheric Administration (NOAA) Fisheries Service in Galveston to learn how turtles help scientists. Fishing kills hundreds of thousands of turtles around the world each year. Often turtles are not the target species but get caught in fishing nets and drown. To reduce the carnage all U.S. federally regulated nets must have a turtle excluder device (TED). Shrimp imported to the U.S. must also come from countries using TEDs. At the NOAA turtle barn in Galveston, loggerhead turtles are raised to test TEDs. Hatched from eggs taken from wild turtles, these turtles are carefully raised, doing a small amount of research before being released back to the wild. I was in turtle heaven as we entered the barn and saw hundreds of turtles doing laps in their individual enclosures, my camera battery fading as I attempted to get the perfect turtle photograph. The youngest turtles would have fit in the palm of my hands if we were allowed to tough (we weren’t), those born in 2014 were dinner-plate sized and swam circles in large barrels. The turtles would stay at the barn for only two years before travelling to Florida to participate in the testing. Master Naturalists Carlos Rios and Maureen Nolan-Hilde helped our tour group discover what a turtle work day is like, a giant fishing net spread across the lawn next to the turtle barn. “Crawl into the net, then hold your breath and pretend you are swimming all the way to the end. As you climb out of the TED tell us what kind of turtle you are,” Rio instructed. I stumbled through the net as my arms flapped in a feeble imitation of a green sea turtle; my lungs burned as I thought of the thousands of turtles that used to drown in fishing nets. “Each turtle will only test three nets,” explained Nolan-Hilde and have a team of divers accompanying it to ensure its safety. The turtle is released into the net and timed as it finds escape through the TED. The divers recapture it and return it to the boat. “Now it only takes a few seconds for the turtles to escape. It used to take four or five minutes,” explained Rios on how excluder devices have improved as a result of NOAA’s research. Although these remnants of the Jurassic age can live several decades, these turtles retire from their work after only three tests and are released back to the wild. My mind reeled when Rio said these turtles would return to lay eggs on the beach where they were born even though they have never seen it! “Keeping only a few grains of sand with the eggs when they are removed provides enough information that the turtles can find their way back where they came from,” he explained. It appears sea turtles have greater powers than even ninja mutant turtles. My love affair continues. Public viewing at NOAA Fisheries Service Galveston Laboratory is limited. Weekly tours should be booked well in advance by calling 403-766-3500. No reservations are needed for Ocean Discovery Day on March 12, 2016. Sea Turtle Inc. on Texas’s South Padre Island offers visitors a chance to see rescued turtles. 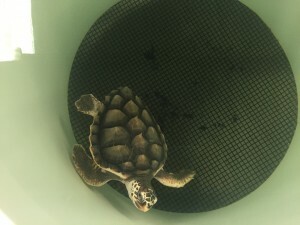 http://www.seaturtleinc.org. Turtles with jobs? It’s true! Find out more from my friend @Reinventure – Click to Tweet. Discover why sea turtles have greater powers than even ninja mutant turtles: Click to Tweet. Discover how these turtles in Texas got themselves jobs via @Reinventure. Click to Tweet.